growing up as a little girl, i was a very picky eater. just ask my mom. i grew up on chicken patties and found several ways to make them. refried beans were one thing i would not touch with a ten-foot pole. during my junior year of high school, i went on a mission trip to our church’s honduran orphanage after hurricane mitch hit. it was a eye-opening experience and i became very thankful for what i had. i also tried refried beans for the first time, in an authentic honduran restaurant and actually liked them! the version that i had was loaded with goat cheese and was very creamy. when i got home, i recreated them and have been eating refried beans ever since, and always remembering my trip every time i make them. in a small, microwave safe bowl, stir together all ingredients until blended well. top with cheddar cheese and microwave for two minutes. allow to rest for a minute and microwave for an additional minute. i enjoy these beans on top of a plate of nachos, pictured above. 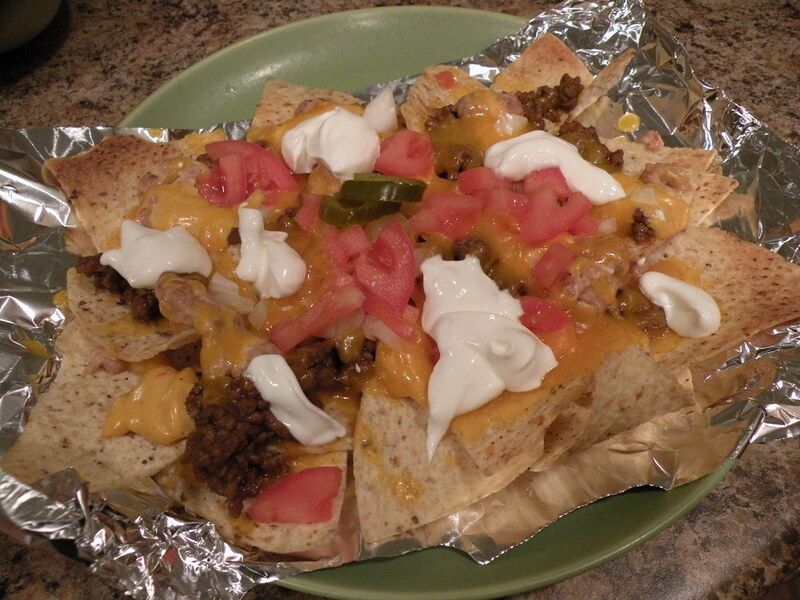 here’s what i use to make my nachos. 3. place under broiler until cheese is bubbly and chips are lighly browned. 4. top with sour cream and lettuce as desired. 5. place entire sheet of foil on a plate and serve. clean up is easy! I need this Weight Watcher’s style haha! Nice recipe. I’ve never made refried beans from scratch… I’ll have to try it sometime! <3 you! It’s the first place I ate them… add a little bit of cheese to anything and I’ll be willing to try it! 🙂 I guess in this case, it was a bit more cheese because you already put cheese on top of the beans. 🙂 See you soon!